Marcus, Mila and Turtle (yes, Turtle!) Tinkler are siblings. Mila is the eldest and has wild and wacky ideas. Turtle is the youngest and is rather odd (she thinks she actually is a turtle). Then there's Marcus, the middle one, who thinks he is the most normal of them all, but is he? 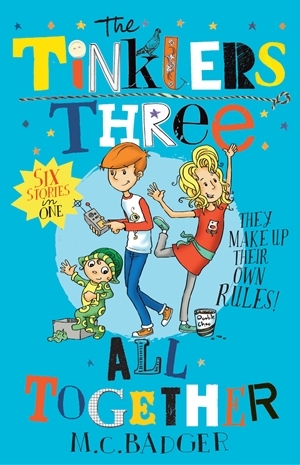 The Tinklers Three All Together is a collection of six stories about these three children who live alone (their parents are in a travelling circus) and 'make up their own rules'. Rules like: the Tinklers never catch the lift on windy Monday mornings; the person who did the inventing must never go first; and there must always be three tubs of ice cream in the freezer. Follow the Tinkler three as they trick the Splatleys with circus glue, fly on a giant bird, eat pancakes with chocolate ice cream and bacon for breakfast (or in Turtle's case, with lettuce - yuk! ), and have other adventures. What would you do if your children nailed their beds to the wall, off the ground, because they wanted bunk beds? How about if one of them went swimming at the local pool and forgot the jelly crystals in their pocket? The Tinklers are the kind of kids who get into scrapes and raise eyebrows, but seem to come out on top, and their antics will make you chuckle. Meredith Badger's stories are easy to read and will entertain, but be careful lest they inspire children to turn ordinary activities into hair-raising adventures of their own!